Dual density Helm Station Pad 15" x 38" with Rubber base. We start with our 6mm Molded Diamond groove for traction + 9mm Plush for comfort + 6mm Rubber bottom layer. Allows you to move the pad where you need it. Also works great in the galley. Available in: Black, White, Gray and Dk.Gray. 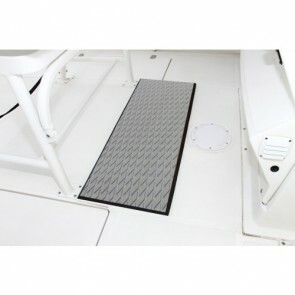 Dual density Helm Station Pad 15" x 38" with Self-Adhesive. We start with our 6mm Molded Diamond groove for traction + 18mm Plush for comfort + 3M Self-Adhesive for a strong, fast & clean application to fiberglass, paint and metal surfaces. Available in: Black, White, Gray and Dk.Gray. Dual density Helm Station Pad 15" x 38" with Self-Adhesive. We start with our 6mm Molded Diamond groove for traction + 9mm Plush for comfort + 3M Self-Adhesive for a strong, fast & clean application to fiberglass, paint and metal surfaces. Available in: Black, White, Gray and Dk.Gray.